The following is a representative list of public and private sector projects Precision Service & Pumps have undertaken in the course of our service history in the industry. These specific contracts depict the various kinds of projects and the scope of work that our team is capable of performing for our clients. The list of illustration projects will be increased periodically to showcase additional skills and services our company can offer current and prospective clients. A complete list of references is available upon request. "On behalf of TAURUS VENTURES I would like to express our thanks to the site crews and backup staff at Abbotsford. The site access was not the best, requiring care not to spoil the grass. The technical requirements of the electrical equipment required special attention to detail. Site safety of course had to be addressed. In all of the above areas you were excellent and handled the challenging conditions with great dedication. You showed that your company slogan "Service Beyond Expectation" is indeed true. You arrived on site as work crews, you left as friends. GREAT JOB..."
It is with great pleasure that I write this letter of recommendation for your crew for the Aquifer Testing conducted at the (FMRP) Faro Mine Remediation Project Site. I would like to mention that right from the time of arrival at the orientation I was extremely impressed with the conduct of the entire crew. They were receptive to each component in the orientation by way of engaging in questions and answers. This is a very important part of healthy collaboration on site. As we have now brought this scope of work to completion with great success, with no recordable or lost time incidents. I look forward to working with Precision Services & Pumps on future projects and hope that the strong Health & Safety Culture I see developing in your company continues. Re-development of 16" production Well #4, by mechanical surging in combination with Carela Bio-Forte Plus treatment. Initial specific capacity of approx. 32 USgpm/ ft. of drawdown (1648 USgpm), was improved to approx. 44.5 USgpm/ft of drawdown (2292 USgpm). 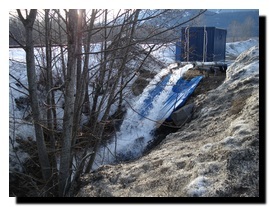 Flow test, re-develop and re-test municipal wells Industrial 'A' - 600 USgpm from 160 ft., and 'C' - 1000 USgpm from 140 ft. Highland Valley Copper - Strip, Inspect and Repair 200 HP submersible well pumps. Supplied and installed stainless steel pump, piping and fittings for test pump installation in test well at Britannia Beach, B.C. Flow tested three (3) new wells which will provide alternate water supply to three municipal parks. Also supplied the pumps and fabricated all final down well and header piping for these wells. Charlotte Sanitary Pumpstation - New pumps and station retro-fit. As well as many upgrades, cleaning, and maintenance on several other sewage lift stations throughout the District. 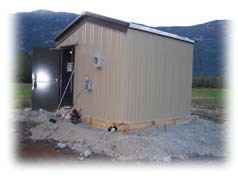 Supply and installation of a complete new well water supply for Lac La Hache, by supplying and installing new submersible well pump and motor, pitless adapter unit, well head security kiosk, prefabbed pumphouse, poured rienforced concrete slab, all plumbing, piping, electrical, and Scada control panel. Conducted initial flow tests, re-developed, and then re-flow tested 5 major community water supply wells. 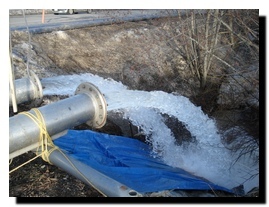 Seymour Dam Site - Install pumping system involving four (4) wells for level monitoring and testing. Sanitary Pumpstation No. 11 - New pumps and piping retro-fit. 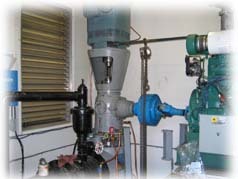 Refurbish 100 HP motor and re-build 260 ft deep line shaft turbine pump, shafting, spiders, etc. Community Booster Pump Station Upgrade - Sub-contractor services for mechanical works including installation of Owner supplied 150 HP line shaft turbine, exterior pre-cast concrete flowmeter chamber, relocation of existing station's 12" PRV bypass piping system, and upgrades to wellheads of municipal water supply wells # W205-01 and #W205-03. Fabrication, supply and installation of new vaccum collection system for community water supply. Cooling Water Well Field - Flow tested 20 wells and established new pumping rates for each well to balance the field system. Stehli Talbot Holdings Ltd. Pemberton, B.C. Supply and installation of a complete new well water supply for community, by supplying and installing new submersible well pump and motor, pitless adapter unit, well head, prefabbed pumphouse, all plumbing, piping, mechanical and electrical. Complete installation and hook up of new well, as well as upgrade existing wells with new pumps and equipment. Precision executed complete well seals as per B.C. Government Grounwater Regulations. Complete mechanical fabrication and installation of new well pump station including: New 125 hp lineshaft turbine pump system, pitless unit for Precision supplied 175 hp submersible pump and motor, c/w flowmeters, valves, control valves, backflow preventer, and transducers. As well as well redevelopment, and one well closure. Well flow tested 3 wells, one for 7 days running time, and the other two well tests for 24 hrs each. Replace 2 Submersible well pumps, redevelop and test 2 wells, maintenance on water treatment and conditioning system, and water reservoir cleaning.